Work is crazy, it is one of our busy seasons and we aren’t even having our main worship concert this year due to renovations. Why do I not remember it being this nuts last year WITH our big concert? Bryan and I finally made the Christmas menu so I can get started on some of the shopping. We still aren’t sure if we are making our meal on the 24th or the 26th since we are working in a soup kitchen on Christmas Day but we’ll figure that out. It is also going to be smaller this year than normal because I don’t want to be eating it for DAYS! The weekend before Christmas, I plan to lock myself into the kitchen and get some goodies made. I didn’t do it last year and really missed it. Man, was Bryan ever a grump (I am treading lightly, my real description is not so politically correct:) yesterday. He was all stressed out about his block 1 test today and what does he do? He scored a 97.5. Only missed 1 question. Brat. I told him to stop stressing and that he would do fine. He even admitted tonight on the phone, that he should listen to me. Well….duh :). Our trip to Texas was good, but did I ever tell you how much I hate driving…LOL! Almost 2000 miles in 5 days. And I get to do it all over again in March for Bry’s graduation when he gets his wings. Sigh. Managed to finally get our Christmas cards ordered. I am such a slacker this year, as they normally go out in the mail the day after Thanksgiving and here it is December 1st and I just ordered them. I slacked even more and went with premade, not my own design. Sad, really…LOL! Here’s a sneak peek in case I slack even more and don’t get them in the mail till after Christmas :). And that’s it, I am heading out. Pray my house doesn’t fly away, the weather out there is horrible. I absolutely love reading your post, Lacey! 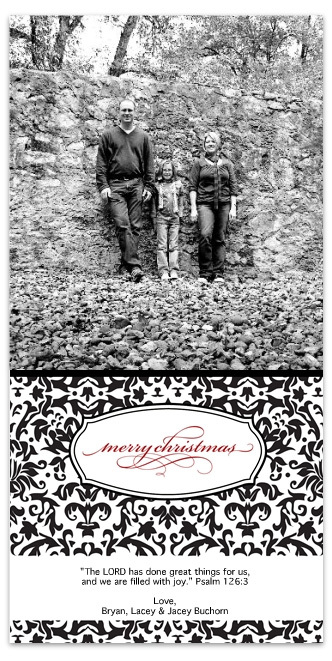 …And that Christmas card is gorgeous! I love it! LOVE your holiday card :) ill be storing away that inspiration when i go to make ours! I Love your card!! very Nice!